We draw our grace from strength. The TSCA conditioning class is designed to not only compliment your other circus classes but to build your overall strength and enhance your quality of life. 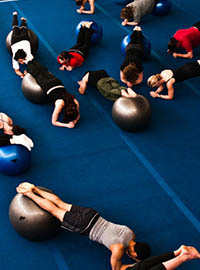 Conditioning is one of TSCA’s most popular classes, drawing everyone from non-circus people to serious performers. The focus of the class is purely on developing muscle strength and endurance with functional stability exercises that use your own body weight, physio balls and bars. Open to all levels of ability. VIEW OUR CLASS SCHEDULE FOR DATES & CLASS TIMES!